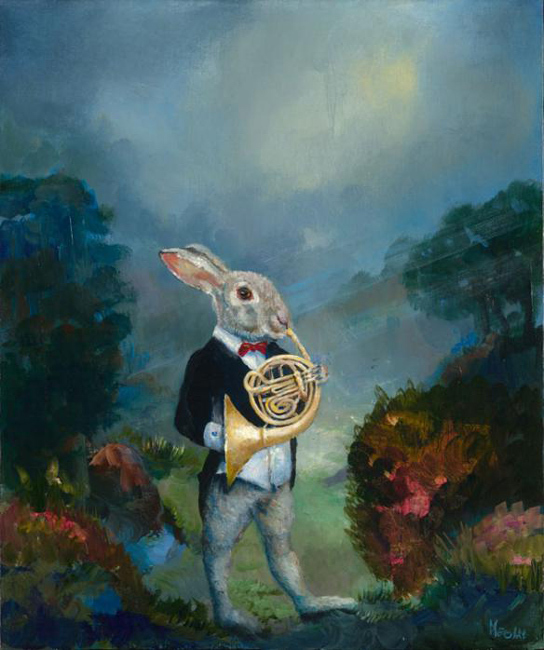 Siegfried’s Horn Call, 30 only Fine Art limited edition Giclee prints titled Siegfried’s Horn Call with an image size of 61x51cm is now available at Etching House, hand signed and tilted by Melissa Egan, this new artwork is only $1550, and Etching House lay Buy is available. For framing of Siegfried’s Horn Call the sheet size is 83x71cm. Using animals as metaphors Melissa’s latest and much celebrated body of work resulted from the development of her close relationship with an internationally renowned symphony orchestra. Siegfried’s Horn Call, The Concert Master, Glen, Mahlor Symphony One Movement Three, Dress Rehearsal using the best fine art material Archival Pigment on Archival Hahnemuhle Paper these Giclee prints may also be referred to as Digital prints as opposed to etchings or lithographs, utilising the latest technology it has allowed for stunning limited edition prints by Melissa Egan to be sold at $1550.